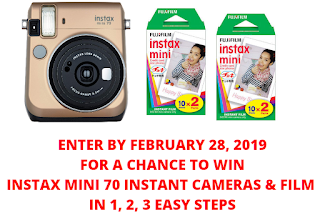 Fuji Instax Mini 70 Camera Giveaway - 35 Winners Win a Camera and 2 Packs of Film. Limit One Entry, Ends 2/28/19 - Photo Upload Required. To enter you must draw a heart on a paper and write a name of a person you care about and take a selfie with it. Not many valid entries yet on this one so hopefully can have a bunch of winners! PRIZES: A total of thirty-five (35) prize winners will be randomly selected in connection with this Sweepstakes. All prize winners will receive a prize bundle consisting of (i) a FUJIFILM INSTAX Mini 70 Instant Camera (ARV US $120.00) and (ii) two (2) 10-exposure packs (Twin Pack) of INSTAX Mini Instant Print Film (ARV US $19.99). Overall Approximate Retail Value (ARV) of each prize bundle: US $139.99 per sweepstakes winner. Total ARV of all prizes awarded in connection with this Sweepstakes: US $4,899.65. Limit one (1) prize bundle per person, per entrant, and per email address in this Sweepstakes.